In 1977 Cape Coral, Florida became the first municipality in the United States to use the RO process on a large scale with an initial operating capacity of 11,356 cubic metres (3 million gallons) per day. By 1985, due to the rapid growth in population of Cape Coral, the city had the largest low pressure reverse osmosis plant in the world, capable of producing 56,782 cubic metres (15 million gallons) per day. In Israel at Ashkelon on the Mediterranean coast, the world's largest reverse osmosis plant is producing 396,000  cubic metres of water a day at around possibly $0.50 USD per cubic metre. In western Saudi Arabia at Yanbu, production started in 1999 at 106,904 cubic metres of water a day. Later in 2009 with some expansion the production reached to 132,000 cubic metres of water a day. In Sindh Province Pakistan the provincial government has installed 382 reverse osmosis plants in the province out of which 207 are installed in backward areas of Sindh which includes districts of Thar, Thatta, Badin, Sukkur, Shaheed, Benazirabad, Noshero, Feroz, and others while 726 are on the final stage of their completion. In China a desalination plant was planned for Tianjin in 2010, to produce 100,000 cubic metres of desalinated seawater a day. In Spain in 2004, 20 reverse osmosis plants were planned to be built along the Costas, expecting to meet slightly over 1% of Spain's total water needs. ^ "Desalination". global-greenhouse-warming.com. 2014. Retrieved 4 November 2014. ^ "Ashkelon Desalination Plant". IDE Technologies. 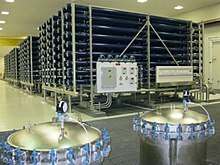 ^ "The 2010 Global Water Awards: Desalination Plant of the Year". Global Water Intelligence. ^ "Toray wins large RO orders in Bahrain and Spain". ^ Giles Tremlett. "Developers panic as Spain scraps river project". the Guardian. This page was last edited on 11 July 2017, at 02:27 (UTC).